At E & E Construction Company, we believe in giving our customers the most professional and economically friendly solutions to their roofing problems. Yes, we understand that hiring flat roof replacement services in Lancaster, OH can be very expensive. This is why we offer alternatives that are innovative, durable, and reliable. Avoiding a roof replacement or restoration can lead to major hazards in the future. Therefore, it is important to take timely action. We advise our customers to diligently maintain their roof if they want to avoid a premature roof replacement. As experienced experts in this field, we offer different kinds of roof replacement services. As your reliable partner for flat roof replacement services in Lancaster, OH we make it as easy and painless for you as possible. In five simple steps, you can get the flat roof replacement done. Inspection – Once you call, our technician visits your facility to inspect it thoroughly for issues and to make an informed suggestion of options for you. Consultation – Our team takes time to assess the findings of the inspection and then we make the best recommendations. We also answer questions you may have and then decide a course of action. Implementing Replacement – After settling all the matters related to roof replacement, we begin work. The team of professionals installs the replacements causing as little trouble and delays as possible. 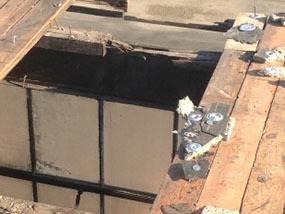 Inspection – After installing the roof replacement, we send an expert to inspect the work. If there are any flaws or missing aspects, we make sure to correct those. Regular Maintenance – Our work is not finished after replacement. We offer customized maintenance services to help you protect the investment you made in your roof. With regular maintenance, our team at E & E Construction Company helps you preserve the roof. 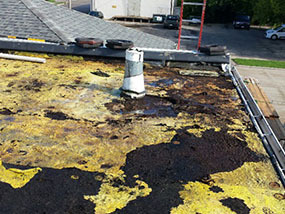 We are proud to say that we offer one of the best flat roof replacement services in Lancaster, OH. Your comfort and satisfaction are important to us. Give us a call at (740) 331-0695 to learn more!